9 × three = Required Please enter the correct value. Dow Jones Industrial Average News, 6/27/2016: It's starting to look like Wall Street is set for another wild day on Monday. Asian markets pushed higher this morning, while European markets were on pace to shave off 2% in Germany and England due to ongoing concerns about Thursday's Brexit vote. You can find more about the biggest winners and losers from the Brexit vote right here. Keep a close eye on the VIX S&P 500 Volatility Index – also known as the market's fear gauge. On Friday, it roared more than 42%. While the mainstream media is sure to talk about the Brexit voting results all day, a number of other stories and profit opportunities could slip under the radar. So let's get started with today's top stock market news, stocks to watch, ways to profit, and economic calendar for June 27, 2016. Dow Jones futures projected a 125-point decline on Monday morning as concerns about Britain's decision to depart the European Union continues to wallop the global markets. On Friday, the Dow Jones fell more than 600 points (a little more than 3%) after markets and analysts dramatically underestimated the possibility of a vote in favor of the Brexit. Of course, Money Morning Capital Wave Strategist Shah Gilani had been predicting since earlier this month that British voters would decide to leave the EU. And he offered investors several profitable plays that have generated a tidy gain. Here's Shah's latest commentary on why Brexit happened, and – more importantly – what the Brexit results mean for your money. The Brexit vote is punishing European banking stocks and the broader financial sector. In early morning trading, shares of Barclays Plc. (NYSE ADR: BCS) Credit Suisse Group AG (NYSE ADR: CS), Deutsche Bank AG (USA) (NYSE: DB), and Royal Bank of Scotland Group Plc. (NYSE: RBS) were all seeing red. 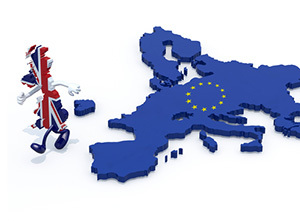 Britain's decision to depart the EU will dramatically impact cross-border financial regulations, and investors can anticipate significant changes to banking laws in the wake of the decision. While analysts and media hounds are howling about the Brexit and the possibilities of a stock market crash, investors are missing a chance to make incredible gains over the long term by tapping into one of the world's most society-changing technologies. This technology is going to completely disrupt the international order in ways that the Brexit never could. Here's more about this amazing opportunity. Gold prices continue to rally in early morning hours, while gold producers are having some of their best trading days in years. But the real winner in the Brexit vote has been Bitcoin. The digital cryptocurrency continues to surge as investors take to safety. The thing is, Bitcoin prices are about to tick much higher thanks to a major event in the world of digital currency. Read about it right here. Crude oil prices fell again in early hours as trader sentiment has turned negative in the wake of the Brexit vote and concerns about an oversupply in the global oil market. WTI crude oil was off 1.7%, while Brent crude slid 1.5%. On the deal front, shares of HeartWare International Inc. (Nasdaq: HTWR) rallied more than 95% in pre-market hours on news that it will be purchased by medical device giant Medtronic Plc. (NYSE: MDT). The $1.1 billion all-cash deal will be completed by October and will help Medtronic access new technologies in heart healthcare. Shares of Intel Corp. (Nasdaq: INTC) are in focus today on news that the company is looking for a deal for its security division. The firm is considering a deal to sell Intel Security, which it purchased six years ago for roughly $7.7 billion. The Financial Times reports that the most likely buyer would be cyber security giant McAfee. Keep an eye on shares of TransCanada Corp. (USA) (NYSE: TRP). The Canadian energy company is seeking an arbitration hearing under the rules of the NAFTA trade agreement regarding the Obama Administration's decision to reject the Keystone XL pipeline. The energy company is seeking at least $15 billion in damages. Apple Inc. (Nasdaq: AAPL) stock was off another 0.6% in early trading as concerns about exposure to the struggling global economy weighs on investor sentiment. Companies reporting earnings on Monday include NovaGold Resources Inc. (USA) (NYSE: NG). International Trade in Goods at 8:30 a.m.